Narrator: Then you need to know about 'Spurskate.' The newest Bikini Gulch craze! SpongeBuck: (he and Pecos Patrick are skating) Isn't this fun? Pecos Patrick: Yeah and anyone can do it, even me! 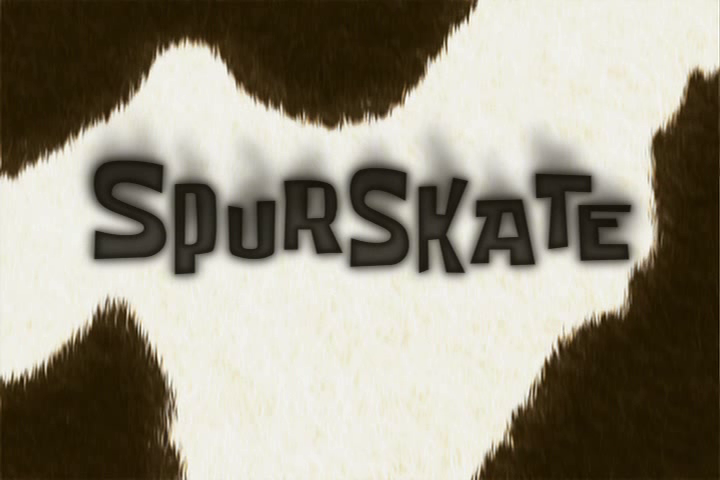 Narrator: The Spurskate is great for anyone. You can freestyle spurskate, (Hopalong Tentacles turns around and around and causes a hole in the ground) or go extreme spurskate! (SpongeBuck uses a half-pipe to skate over some flaming coral that seahorses are balancing on their head. SpongeBuck lands on his feet but breaks his body and all that's left are leg bones and boots) It's up to you! So stop that walking (SpongeBuck skates through a couple) cause the world is passing you by on spurskates. Fish #2: Wow! What are those? Narrator: They're spurskates! So join the rest and be your spurskate best.